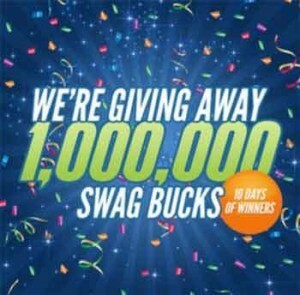 www.Swagbucks.com – One Million Swag Buck Giveaway. First, what exactly is Swagbucks? From my own point of view, i could say that Swagbucks is one of my favourite incentive ways to earn virtual currencies that i can exchange for real life rewards – Swagbucks codes. I can redeem free gift cards for use in place like Amazon.com, Target.com, Overstock.com, walmart.com and the list goes on. All of this earned easily by simply searching the web. Things I already do on a regular basis. These virtual currencies are called “Swagbucks” which can be redeemed for merchandise. The web based online rewards program was launched 5 years ago in Los Angeles, California and as gain in popularity. The concept of earning rewards for something you already do on a regular basis has adept from around the world. But you can earn more also. As a member of swagbucks.com you could receive more virtual points swagbucks codes by taking short online surveys, shopping through Swagbucks affiliate stores, watching videos online, playing online games and obviously searching the world wide web. For sweepstakes lovers! Like us! Swagbucks incentive portal is sponsoring a great sweepstakes where you could win as a member their One Million Swag Buck Giveaway. For the first time in Swagbucks history, they’re giving away One Million Swag Bucks! During the Entry Period, you may redeem 35 Swag Buck(s) to receive one entry into the One Million Swag Buck Giveaway. To register, follow online registration instructions located at www.swagbucks.com. Swagbucks are promotion interesting sweepstakes on a regular basis. swagbucks .com – Good luck! I Julie Mendoza accept my Prize number in full given by Publishers Clearinghouse and respectively claim it for life to WIN $7000.00 A week for the rest of my life. Thankyou so much for giving me & my family this opportunity of a Lifetime & thankyou GOD.. I am completely lost dealing with this hole thing I’m not sure if I’m doing anything right PCH..? TRIED OF MY LIFE ,LIVING THIS WAY..PLEASE HELP…PLEASE PICK ME…THANK YOU AND GOD BLESS YOU ALL. you begin to search. It was taken off and it is impossible to search for the $1 Million contest now. That is very unfair for your customers trying to enter your contest and no where to search except out of date links. I have entered PCH for 7 years through mail and by computer. I never win anything. Unfair, Unfair.